Or … in case you were wondering. Q.What is the shipping charge? A. Simply put: $9.50 for the first two stockings shipped to the same address and $2.00 each after that. It gets added at the final stage of checkout. Q.How many letters can I have on one Christmas stocking? A. We can knit 8 letters into a stocking before the letters begin to wrap around and show on the backside. Embroidered letters can be some what narrowed and widened, so up to 16 letters on the face of the stocking. See Personalization. Q.What color will personalization be? A. Personalization is the same color as the personalization or diamond pattern shown on the enlarged photo of the design you chose. If you want a different color, include that information in the “Notes for us” section at checkout. Q. Can you personalize a stocking which has an accent mark above a letter? A. No problem! If the personalization is to be embroidered, it will be automatic. 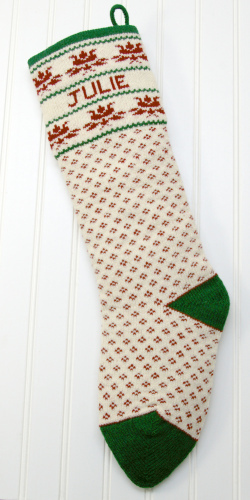 If the personalization is knit in, we hand embroider the accent mark after the stocking is knit. Q. How long will it be before I receive my stocking order? A. We ship priority mail which takes between 2 and 4 days. After about the 5th of December no carriers (Post Office, UPS, or Fed EX) guarantee Christmas delivery due to the weather patterns in December. We can use different carriers if you prefer, but the ship charge will float to cover the different carrier cost. Embroidered personalized stockings—stockings we have in stock—will still ship within 3 or 4 days of your order … right up close to Christmas. Yep, we’re that good! Your flexibility with stocking design choices gives you an advantage for Christmas delivery the closer we are to Christmas and the shelves begin to empty. The knit to order stocking, with a KNIT IN name take about 3 weeks. In October, November and December, our busiest months, we work faster, but have more orders and the schedule fills up. If you order just before a knitting cycle (before Tuesday at noon), the stocking will be ready for mailing in two weeks from Tuesday. If you order after the knitting cycle begins, it will be next Tuesday that we begin knitting your order, making it a 3 week cycle. With only 4 weeks between Thanksgiving (when you realize you need a stocking) and Christmas Eve (when it must be hung), the cut off for Christmas delivery of knit personalized stockings is a moving target. Usually between Dec 5 and 9. Q. It’s almost Christmas! What’s the current delivery time on stockings? We’ve been doing this for more than 30 years. We know when we’ll run out of hours to knit (usually during the first 9 days of December). And we stop promising Christmas delivery of knit-in personalized stockings when we know it’s time. 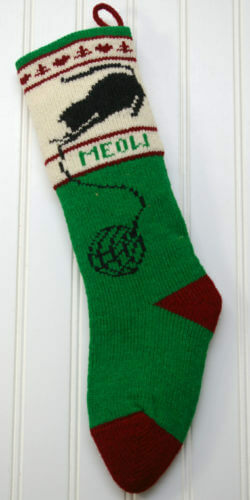 The good news is that we knit up stockings for embroidered personalization all summer long. You order, we embroider the name, stitch and block the stocking, and it’s ready to mail. Usually end of the week. After December 1 you might prefer to call to see what is available, especially if you have 4 or 5 matched stockings in mind. We ship by USPS Priority Mail. Our experience has been very good with deliveries even right up to Christmas. Though one year a Postal truck caught on fire…oops, and blizzards tend to slow that intrepid Postal Service. Q. What if I need a stocking faster? A. The stockings that are personalized with embroidery have a faster turn-around time. We stock MOST designs in MOST colors MOST of the year. They’re ready to embroider and ship. Pretty darn quick! Check the chart for stockings we can personalized and mail FASTEST! If you don’t like the baby blanket you ordered as a shower gift, give us a call and we can personalize and mail a stocking very quickly (if it’s not Nov or December). Q. How will I know if you received my order? A. If you order online, you should receive e-mail receipt within 36 hours. If you don’t receive a receipt, we may not have received your order. 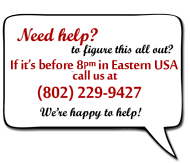 Please call 802-229-9427 for verification. Q. I like your designs, but what if I want the sledders at a border above the Christmas tree instead of the presents as shown? A. We can do that for you! Fill out the custom stocking request on line. We’ll confirm your order and start knitting. Expect these to take 4-6 weeks. Q. How can I tell if your cranberry will work with my red? My Christmas decorations are a very specific color of red. A. We are happy to send you color swatches of our yarn colors. Please use our contact form to ask. We’ve used the same recipe for Cranberry since 1980, but a different herd of sheep will alter the tone of the color a bit. Q. 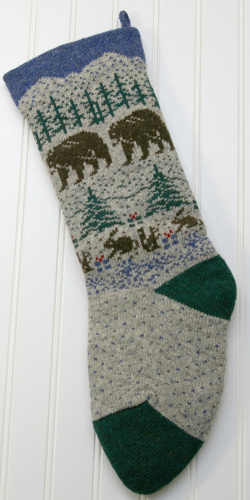 Can you duplicate the stocking my grandmother knit for me 50 years ago? A. Maybe. Send us a photo of the stocking. Include measurements of the length and width. We’ll take a look and then tell you how close we can come in color and heft. We design and re work stockings through August.